Welcome again to CONCH's blog page. Below you can read an account of the archaeological training from one of those who was trained: Severine Kizito. He gives us an introduction to the some of activities of the CONCH project and an account of a watching brief carried out by himself, Graham Bruce and Ally Mbarouk. Archaeological investigations and training were carried out at Pangani during July 2018 in different areas of the town including around the Boma, Uhuru Ground, and Pangani’s football ground. This combined effort involved archaeologists from the Tongoni office of the Tanzania Antiquities department, UZIKWASA and, the universities of York, Bournemouth and Uppsala, and the York-based archaeological company OnSiteArchaeology. This blog explains how and why the archaeological investigation and training was conducted at Pangani, and how it will help the sustainability of heritage preservation activities in Pangani, as supported by UZIKWASA and wider efforts to promote Pangani’s tangible and intangible cultural heritage. During the archaeological investigation, two methods were used. One of these was geophysical survey of open spaces in Pangani, which was led by Professor Kate Welham from Bournemouth University, ably assisted by Hayden Scott-Pratt. The equipment used included a magnetometer and fluxgate gradiometer. These can detect variations in the magnetic conductivity of the soil below ground level due to the presence of stone structures, iron objects and buried features such as pits and ditches. The survey of Pangani football ground, on the edge of town failed to detect any anomalies, but surveys of some of the other areas did suggest there were buried archaeological horizons in those locations. Figure 4. The Old Mosque (Photo. Severine Kizito) (click to enlarge). The other method involved was excavation, which involved the careful excavation of a small trench adjacent to the Old Boma so as to uncover cultural artifacts and to test for the presence of buried buildings or features. The excavations were undertaken under the supervision of Graham Bruce from OnSiteArchaeology assisted by myself and Ally Mbarouk from the Tonogoni office of the Tanzania Antiquities department. The excavation was a great success and attracted a lot of public attention, especially from school children. We uncovered the remains of early wall foundations, cultural artifacts including Omani-era pottery, metal objects, shell and bottle glass (to mention but a few). These were catalogued and photographed, and are now preserved at the Pangarithi Heritage Centre for further analysis. SITE NAME~ New Mosque immediately north of the Heritage Centre on Salaama Street (also known as Lumumba Street). The site was visited with the co-operation of the builders. A total of 30 square foundation trenches, each 1.5m x 1.5m and 1.8m deep had been excavated and were being prepared for concrete to be poured. The foundations were inspected and the following observations made. Pale to mid grey clean natural sand was consistently visible at a depth of approximately 1.20m to 1.40m below ground level. This was often overlain by a layer of brown sand between 0.30m and 0.50m thick. 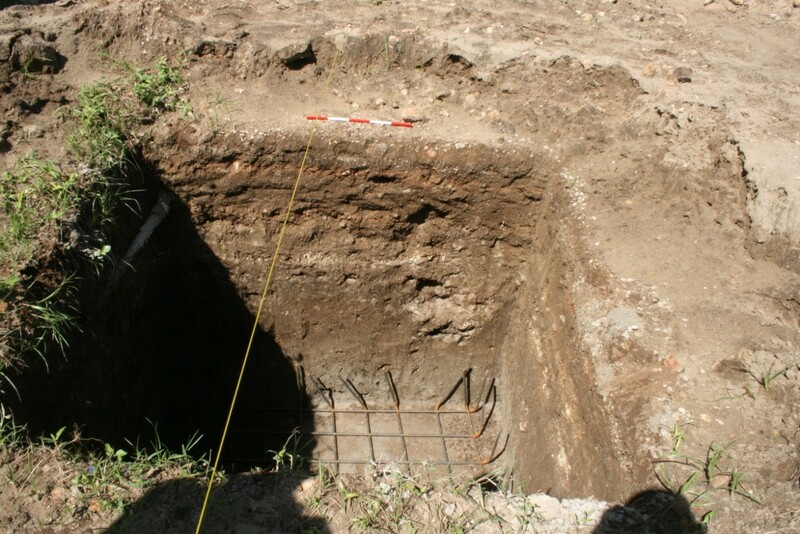 In several of the trenches wall foundation trenches were observed cutting into the brown sand and in some cases there were thin layers of mortar associated with these that are likely to represent floors, overlain by several layers of red and grey sand and soil. Several other complex layers followed suggesting a sequence of buildings. The remains of walls were also seen in the top 0.50m, probably related to relatively recent buildings. Throughout the site fragments of pottery were seen. A small sample of these were taken to the Heritage Centre for identification. Work on the digital heritage applications, especially the twine app, to better narrate the history of buildings, streets and an overview of the history of Pangani. Last (but not least) to focus on the intangible heritage and Indigenous knowledge of the people at Pangani in training and preservation.